The rating of movies is integral to Netflix and its ballyhooed recommendation engine. The more movies you rate, the more accurate Netflix recommendations become. Rating Ben & Jerrys ice cream flavors might not be as mission-critical to that brand as movie rating are to Neflix, but both companies are leveraging Facebook to ratings a group experience, rather than a solo one. Facebook Connect enables other Web sites to link to Facebook members’ profiles (with their permission) to push/pull data between the sites and Facebook. Facebook Connect will prove to be the most important development from Facebook since they lifted the students-only provision in September, 2006. Connect allows the “I know more about you than I used to because we’re both on Facebook” concept, and spreads it across the entire Web. Every time I visit a site, read an article, buy a product, etc. I can let my friends know about it – provided the site deploys Facebook Connect. Ben & Jerrys and Netflix are two early adopters of this technology. Maybe their implementations of Facebook Connect will give you some ideas of how to leverage it for your brand. 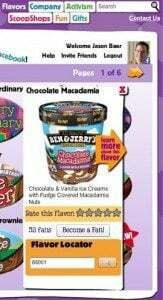 On Ben & Jerrys, visitors click a Connect on Facebook button, followed by a Facebook-generated permission button, to make the bridge between www.benandjerrys.com and Facebook. Clicking the Flavors button takes you to a Flash-based scrolling flavor display. Clicking the flavor pulls up a 1-5 stars rating scale, a comments box, a store locator, and the option to become a fan. You can then decide whether to display your ratings and comments on Facebook. If you do, your professed love (presumably) of this flavor, a picture of it, and your comments, are included on your Facebook wall, where it can be “liked” and commented upon by your friends. The Netflix system is similar, with slightly fewer clicks, although it has the added integration of being able to add the movie to your queue directly from the Facebook wall. Nifty. If you’re going to use Facebook as a major component of your social media strategy, tying together your corporate site to Facebook with Connect is worth consideration, isn’t it?